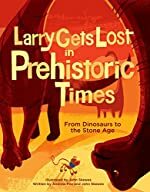 Larry Gets Lost in Prehistoric Times: From Dinosaurs to the Stone Age by Andrew Fox & John Skewes. A Larry Gets Lost Book. Review: ROAR! What was that? Was it a dinosaur? Dinosaurs come to life in, Larry Gets Lost in Prehistoric Times by Andrew Fox and John Skewes. The main character is Larry, the dog, who loves his owner, Pete. Larry loves when Pete reads him a book, and sometimes Larry dozes off into a new world. On a sundrenched day, Pete is reading a book to Larry. While Pete reads, Larry snoozes off into a land bursting with dinosaurs! Larry runs around, trying to find his way home and finds all varieties of dinosaurs along his way, like small plant eating dinos to a big and scary Tyrannosaurus. Larry is terrified. To get home, he travels through different eras, too. From the amazing Mesozoic Era to the freezing Ice Age, each one is packed with adventure; but will Larry ever get home to Pete? Review written by Julia (6th grade student). We would like to thank Sasquatch Books for providing a copy of Larry Gets Lost in Prehistoric Times: From Dinosaurs to the Stone Age for this review. Have you read Larry Gets Lost in Prehistoric Times: From Dinosaurs to the Stone Age? How would you rate it?